Rolex Precision Chronometers are very special watches as they have very high grade movements designed to meet or exceed the highest standards of accuracy and reliability for their day. This was determined and independently tested and certified through tests conducted by an Observatory, usually Swiss or British, such as Neuchatel Observatory, Geneva Observatory, or Kew Observatory. These Observatories tested accuracy and reliability of individual watches over numerous weeks and at varying positions and ambient temperatures. Only individual watches which passed the strictest standards, qualified and were granted permission to be classified as “Chronometer” watches. Furthermore, special Prizes were awarded to the manufacturer that submitted the most accurate wristwatches and the manufacturer that submitted the highest number of watches to qualify as Chronometers. Manufacturers competed fiercely against each other to win these prizes, which were highly coveted and highly publicised. This was a little like motor racing Grand Prix winners of today and yesteryear. Rolex, Omega, Longines and Zenith were the strongest competitors and most successful at both passing these tests to qualify as Chronometers and at winning prizes as outright winners. During the 1930s and ’40s, Rolex was also the most successful watch manufacturer at courting publicity, through literally being ‘on hand’ during many record-breaking events. These were, for example, swimming the English Channel (1927), world automobile speed record (300mph, 1935) and breaking the sound barrier in 1947. No matter how well orchestrated these events came to be, we can not blame Rolex for singing their own praises and capitalising on this at every opportunity. An example can be seen here on the inside of the case-back which reads (winner of) “31 VICTOIRES”. Some fascinating books have been written about these events which must have seemed as equally amazing as many advances in mobile technology today. A brief section of paragraphs covers some of these events and some history of Rolex in our FAQs section found via the link at the bottom left of this page. Needless to say, these watches are still as highly prized today by collectors as they were at the time they were made. To be called a Chronometer today, watches are required to be submitted to an independent Swiss body called the Swiss Official Chronometer Testing Institute for testing over 15 days at a range of temperatures. Here we have a beautiful and amazingly well cared for example with a super rare 18ct Pink Gold watch case with gorgeous ‘Grasshopper’ lugs. This watch has just completed a full restoration by ourselves including movement, watch dial and case. It now looks so good it could, with the classic Roman dial, easily pass for a new watch. As referred to above, this is a Rolex Precision Chronometer movement, which makes it one of the best of its day and highly accurate and reliable. As with all our watches, this is the original movement for this watch which has been completely overhauled and undergone close examination and servicing, test and calibration by our vintage Rolex specialist watchmaker. The movement is in superb condition having had the benefit of proper care and maintenance and only light use throughout its life. When tested on our electronic time-grapher machine it is running within + 7 seconds per day. This is outstanding for any watch of this age. We are therefore highly confident in offering a 12-month warranty with this watch movement*. The movement is signed exactly as it should be: Rolex Chronometer, 18 Rubies, Timed in 6 Positions, Patented Super Balance, Swiss Made, and with the Calibre number 700 and the Serial number E10081. 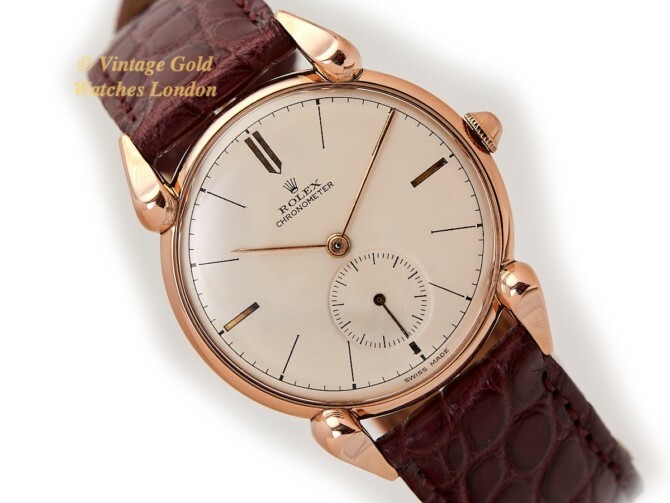 Pink gold vintage Rolex watches are very rare and always highly sought after. The colour of pink gold often varies a little from watch to watch, from a very subtle pink to the much darker pink or red/rose gold we see on modern watches today. Here it is mid-range and slightly pinker than other pink gold Rolex Precisions we currently hold in stock. The size of the watch case is 33mm in diameter, excluding the correct unsigned winding crown. However, the case size and the presence on the wrist is greatly increased by the amazing and quite bold ‘Grasshopper’ Lugs. To give an idea of the difference these make, the overall lug tip to lug tip size is 41mm. The case here is in close to perfect condition and even under high magnification, it is very hard to find any fault. This watch has seen very little use and has led a charmed life. The watch case has been carefully inspected, cleaned and lightly hand-polished to bring it back to the immaculate condition you see here. There are no scratches, dimples or marks visible to the naked eye. The case-back is also of full thickness and has never been inscribed. Inside the case-back, all as expected, correctly signed by Rolex, along with the case ref. 53574 and the Rolex model number 3667. It is also signed: ’31 Victoires’, Haute Precision, denoting how many prizes Rolex had won in Chronometer competitions when this watch was produced. The inside of the case-back also carries the Rolex model number 4431 along with Swiss Geneva 18ct hallmarks. The case-back also carries external hallmarks. This simple and elegant Ivory Cream ‘art deco’ dial features gilt and black lined hour indices. The original, restored gilt ‘Index’ hands transcribe this beautifully balanced dial, complete with quite a large subsidiary seconds dial at six. This is quite a rare dial, although we have seen it once or twice before on Rolex Chronometer watches of this period. The dial is correctly signed: Rolex Chronometer along with the Rolex Coronet and ‘Swiss Made’ below the six. This is the original dial which has been previously restored to a very high standard. The strap fitted is a new nicely matched Burgundy ‘Croc’ Hirsch Regent strap with a Rolex gold plated buckle. However, if a different colour or style of strap is preferred, please let us know and we will do our best to oblige free of charge. We carry tan, conker, dark brown and black in stock, in plain padded leather, crocodile skin or lizard skin, but can also obtain most types and colours of strap from our partners at ‘Watch Obsession’ within 48hrs. Please take a look at their huge range of 18mm straps if you wish, here. Although there is no original paperwork with this watch, the reference numbers, markings, signatures and hallmarks all correct, dating this watch to circa 1944. Detailed particulars are included with the receipt, along with our 12 months warranty*. A separate insurance valuation for the replacement value will be provided at the time of sale. This will also include our ‘Lifetime Authenticity Guarantee’ which states: “If this watch proves to be anything less than totally authentic, or not as described, Vintage Gold Watches of London will offer you a full refund at any time. The watch comes complete with a high quality hardwood presentation box, as shown. A highly collectable vintage gold watch from horology’s most famous name which will provide an excellent financial investment as well as something to treasure and enjoy! This is a truly first-class example of a c1944 vintage Rolex Precision Chronometer in 18ct Pink Gold and in amazing condition. The watch is ready to wear and totally practical for everyday use. If treated with care it will make an excellent investment or family heirloom piece. Even though vintage gold Rolex prices have risen markedly in the past 2-3 years, we still feel great examples such as this are still undervalued and as each year goes by and the world market for vintage gold Rolex watches continues to expand, prices are destined to climb ever higher. Please note, we also welcome part exchanges.